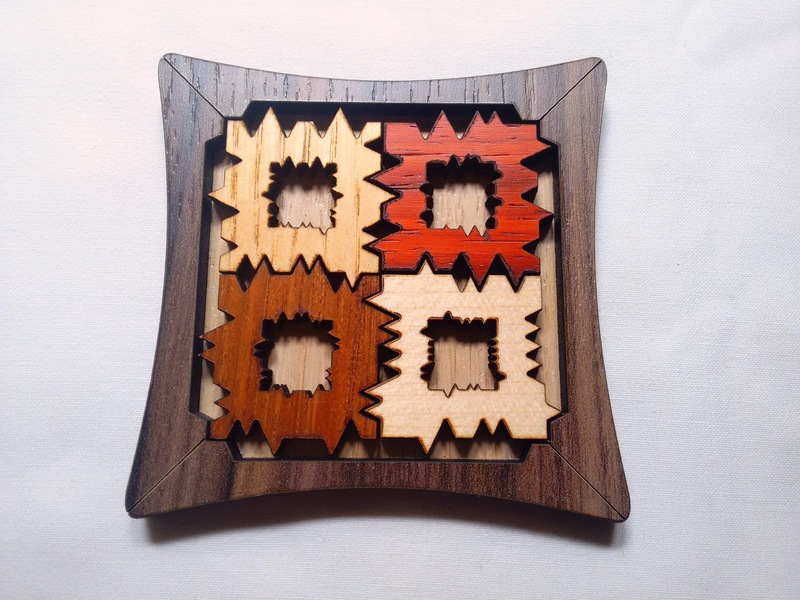 Here's a puzzle that looks as intimidating and difficult as it actually is. No deception - What you see is what you get. A perfect example of simplicity turned into complexity. This is puzzle designing at its best and, when it comes to great puzzles, Jürgen Reiche from Siebenstein-Spiele knows what he's doing. Edelweiss 4.0, as its name suggests, is made with just four different pieces, but don't let the low number of pieces fool you. This is quite a difficult puzzle. 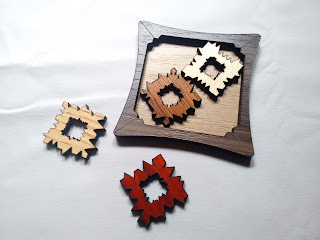 Made from laser-cut wood - wouldn't be possible otherwise due to the size and complexity of the pieces - the puzzle has each of its four pieces in a different natural color to differentiate between them, as they're quite detailed, with their edges filled with bumps of different sizes and spacing. The frame is small measuring only 9.1cm in length (3.6"). As with most packing puzzles, the Edelweiss requires some trial and error to be solved, but since the edges of the pieces are so different you'll know beforehand that some combinations aren't possible. This is also an edge-matching puzzle, since all pieces must match their adjacent neighbors in two ways. The pieces must also match the corners of the frame. This has a difficulty rating of 8/10 from PuzzleMaster and 4/7 from the manufacturer. The manufacturer's, however, makes it look like an average difficulty puzzle and I don't agree. I reckon PuzzleMaster's rating is more accurate, as it shows how challenging this puzzle actually is. I love puzzles like the Edelweiss 4.0. It challenges your way of thinking, without making it completely frustrating. There's a logic to it, you just have to find it. If you think this is too easy, Siebenstein-Spiele also has a 9-Piece version, appropriately called the Edelweiss 9.0. Availability: Edelweiss 4.0 is available from PuzzleMaster for just $15.99 CAD. Check out other great puzzles by Siebenstein-Spiele.